Today was the first day of TED. The talks, however, do not start until tomorrow morning. Instead, today was a time to get registered, get acquainted, participate in some preliminary activities, and attend a kickoff party called, Hooray! Soirée! As you suspect, not exactly what I would choose to do. 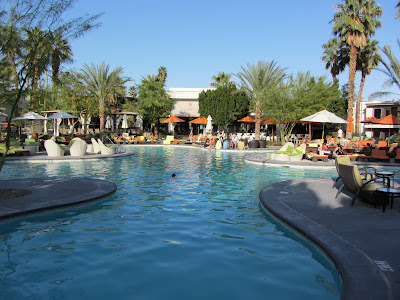 First, here is a picture of the pool at the Palms Springs Riviera to give you an idea of how rough it is here at LoserTED. 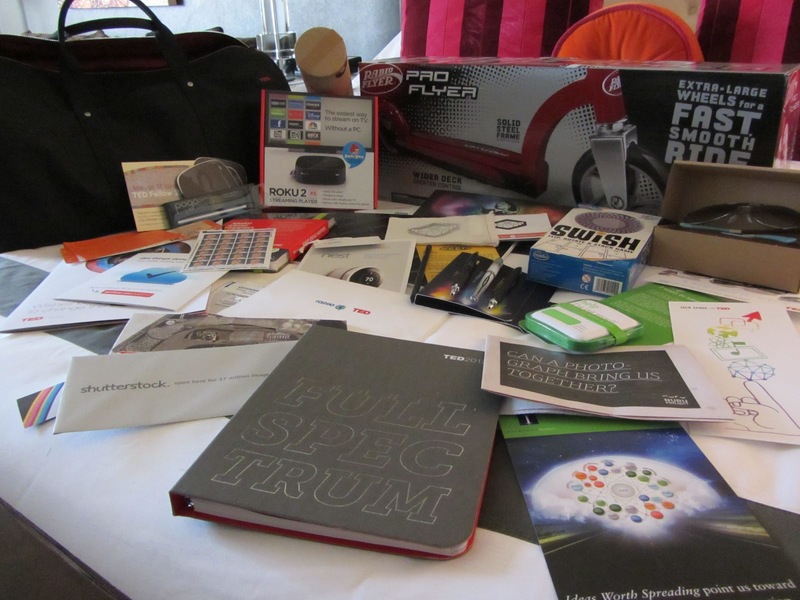 Below is a picture of the items from the goodie bag they give out at TEDActive. It is hard to see everything, but a few things to note are a Roku 2 (TV streaming device), a Jawbone (Bluetooth phone headset), and free installation for a Nest thermostat (given that I bought one a couple months ago and have not had a chance to install it, this is a great gift!) I’m less sure what I will do with the Pro Flyer. Maybe ride it around the office? I did force myself to meet a couple people at breakfast. One owns a business that gives advice to CEOs and the other runs an experiential and digital marketing firm in Chicago. That gives some idea of the diversity of people here. OK, actually they just sat down at my table, so I sort of had to talk to them. I’m still going to count that as meeting people. After all, I could have just continued reading my book (1491—a fascinating look at the Americas before Columbus and the onslaught of Europeans). 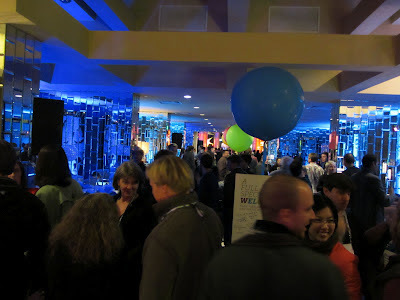 Finally, here are a couple pictures from the party this evening. I forced myself to stay until I had spoken with three people. My strategy was to stand alone at an obvious place (at the top of some stairs) and wait until people came up and spoke with me. 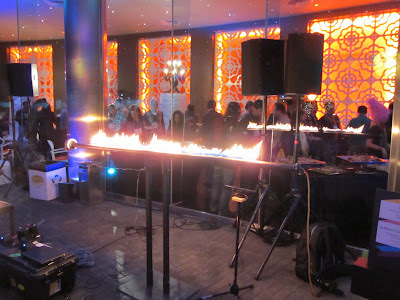 While I’m sure they were interesting people, I was much more fascinated by the people creating the ambient music and the bar of flame controlled by an Xbox Kinect. Tomorrow, the talks themselves. Can’t wait!